I am about two months into Chicago Semester I have been able to learn so much and still a lot left to explore. I have found living in the city feels at times like it moves much quicker than it does. I am constantly busy between my internship, classes, cooking, shopping, wandering around and more. This semester, I can see myself molding each day to the independent woman I am becoming. I am learning to embrace every minute of this semester! My internship site is such a blessing. I love the work I am doing and the people I work alongside. I always knew I wanted to work with a young population, providing assistance to those in need, and New Moms has given me that opportunity. The stories I hear are unbelievable. A lot of our clients are single mothers who are struggling daily just to make ends meet. Many of them are in urgent need of stable housing and employment. The obstacles they go through are unimaginable, and it makes perfect sense why they live with their guard constantly up, closed up to anyone they meet. But they are strong, fearless mothers and they make my job even that more valuable! My weeks have been buys, but very rewarding. On Monday, Tuesday, and Friday I am at my internship site. On Wednesday I’m in class. Finally, on Thursday I’m at Bright Endeavors, this is where New Moms participants work making candles. Also, on most Thursdays or Fridays, I attend art events with the Arts In The City course. So far, I have been able to attend several plays, dances and opera events. This past week I attended Hyde Park Art Institute, far south of the loop. A lot of the art portrayed through the galleries were paintings and sculptures conveying powerful messages. I have always been a person who enjoys seeing paintings of nature, rather than abstract work. Frankly, I get frustrated when trying to figure out what is being conveyed or I should see in an abstract art. There was one painting that stood out to me from all the others. It was a canvas of a dark forest with a large, bright sun in the center. To me the painting made me feel at peace, hopeful, and powerful. It made me think about how there will always be light in the darkest places. Similar to my life, it can feel hectic, nonstop busy Monday-Friday, there will always be light to guide me through. One of the projects in the Arts in the City class is to visit a neighborhood in Chicago and create our own art work display. The neighborhood my partner and I chose was Logan Square, northwest of the Gold Coast. Logan Square among other neighborhoods is home to many coffee shops, cool restaurants and great art venues. The first stop we made was a small, cozy pizza restaurant, called Reno. For those who are lovers of pizza and delicious pastries I highly recommend it. We spent an hour just talking and enjoying the sunny afternoon and eating our delicious food. Walking around at first glance, there is not much to see. 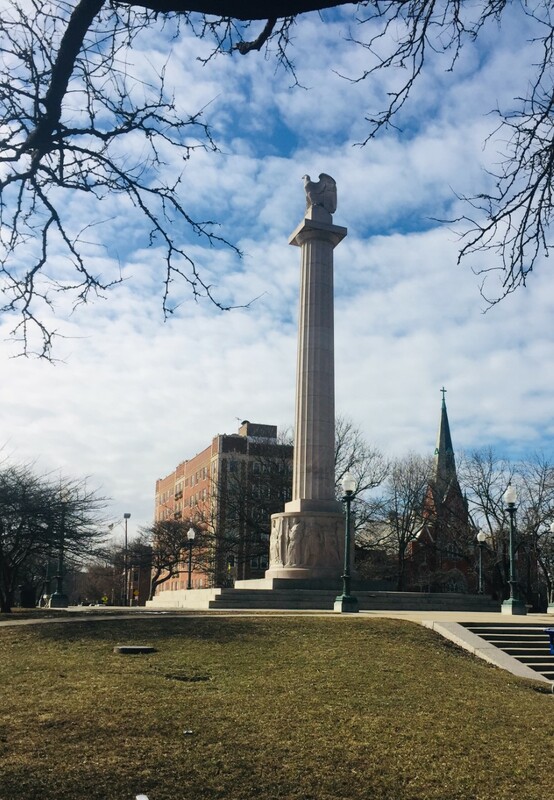 But right in the center of Logan Square we came across several art displays and a large 70 foot tall monument with an eagle on the top. The square stretches through Kedzie Boulevard, providing a great spot for walks and scenery for pictures. When doing research on the statue I learned the eagle is a resemblance of the flag of America and part of the well-known Lincoln Memorial in Washington D.C. It is amazing how one monument can have so much history and significance. Logan Square is one of the many neighborhoods in Chicago I highly recommend visiting.